We stayed the second time in Quo 1. This time, just like last year, Teresa waited for us at the expected time upon our arrival. She s very thoughtful and gave us lots of tips on choices of restaurants and extra informations upon our upcoming trip nearby. The apartment s just 5 minutes from the beach and the sound proofing had improved so much; I did not hear a sound at night. Thank you Teresa and we ll surely come back! Teresa s such a great host. She greet us in the apartment and told us all you need to know such as tourist sites. She even drove us to the ballet camp venue in Sunday afternoon as we accompanied our girls to a ballet camp in San Juan. The beach and all tourist spots are just at your door steps. We had a great stay and thanks again Teresa. We ll surely come back and will recommend this apartment to anyone who s planning to Alicante. Excellent location fully furnished and clean flat. Teresa the owner met us where the taxi dropped us of and showed us round the apartment which was fully equipped with absolutely everything. There was a complimentary bottle of wine, nibbles and water in the fridge which was a nice touch. The double bed was one of the most comfortable and cosy beds I’ve ever slept in, although according to my friends the twin beds weren’t. Teresa was very helpful and friendly. We had her telephone if there were any problems which there wasn’t. The apartment couldnt have been in a better location, everywhere we wanted to go was with in walking distance; the castle, cathedral’s, the beach (which was beautiful) shops & restaurants. There was a supermarket under the apartment block which sold just about everything. Will definitely be going back. Fantastic location, meet on arrival and everything explained. Lovely apartment very spacious and modern. A superb apartment in a great location.Very well equipped.My 2 granchildren loved their "holiday home". Bed was very comfortable. The host left us water, wine, potato chips and some other conveniences. She also left some books which were available for us to read. Super apartment. Really well decorated. Couldn't recommend more!! Apartment is nice, clean and perfectly located. Down stairs you will find a food store, in few steps is Alicante beach, bars, restaurants, shops, museums. In five minutes’ walk, you will find big and very good Alicante market, with big choice of fish and seafood, meat, fruits, vegetables. Beds in apartment are very comfortable. Do not worry about noise, apartment is but very silent and calm, close windows and switch air conditioning, it works very silent and perfect. Teresa is very friendly and helpful. 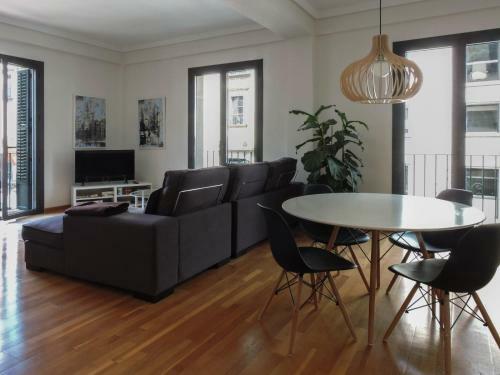 I highly recommend booking this apartment, and you will have great time in lovely Alicante. 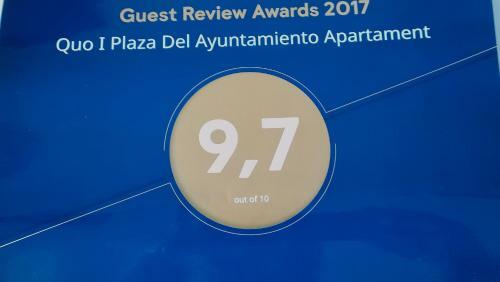 Lock in a great price for Quo I Plaza Del Ayuntamiento Apartament – rated 9.7 by recent guests! One of our top picks in Alicante – and a guest favorite. 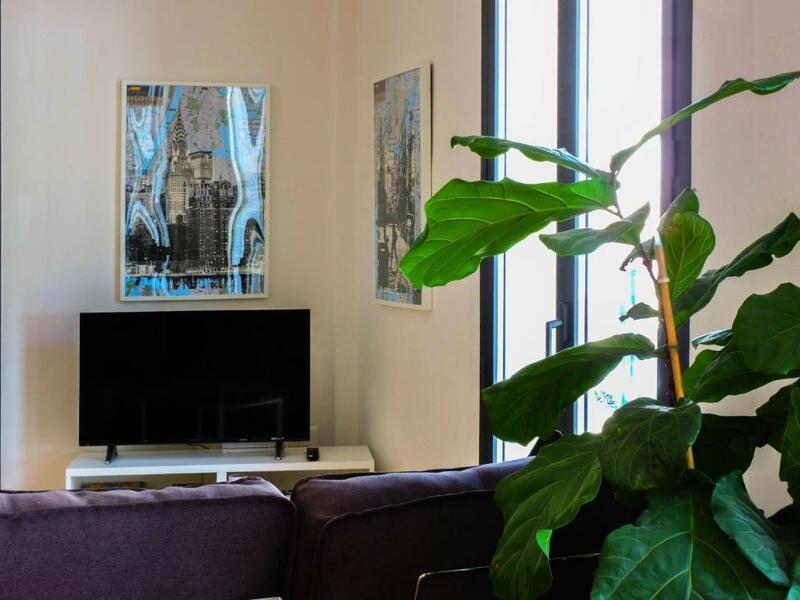 Located in the middle of Alicante, Quo I Plaza Del Ayuntamiento Apartament has accommodations with city views, just a few steps from Town Hall Square. 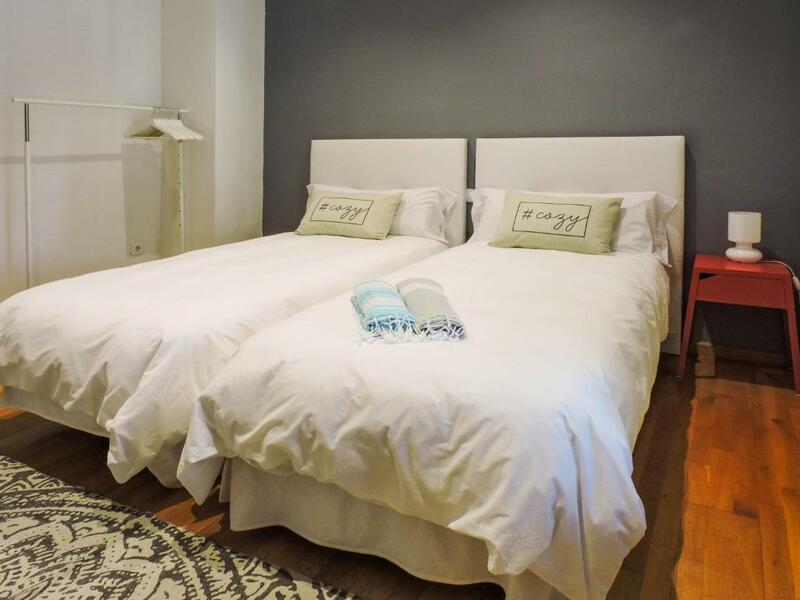 This apartment provides air-conditioned accommodations with a balcony and free WiFi. This apartment comes with a kitchen, a seating area, and a flat-screen TV. 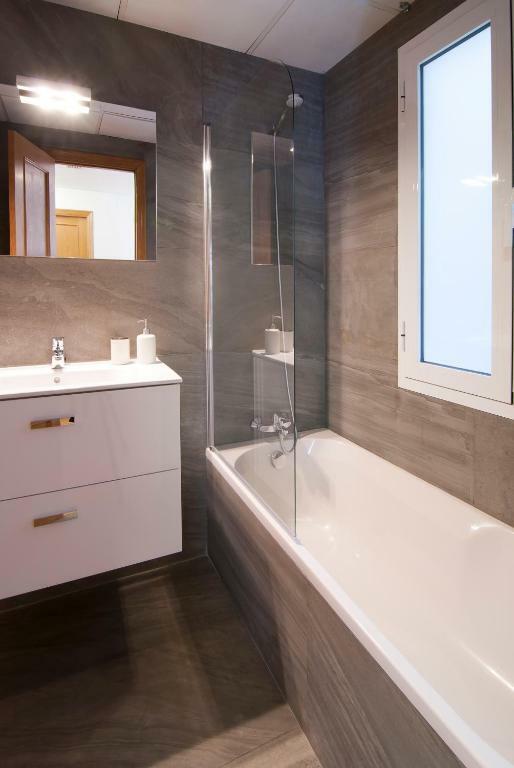 The apartment also includes a bathroom with a bath. The apartment has a terrace. Both a bicycle rental service and a car rental service are available at this property. 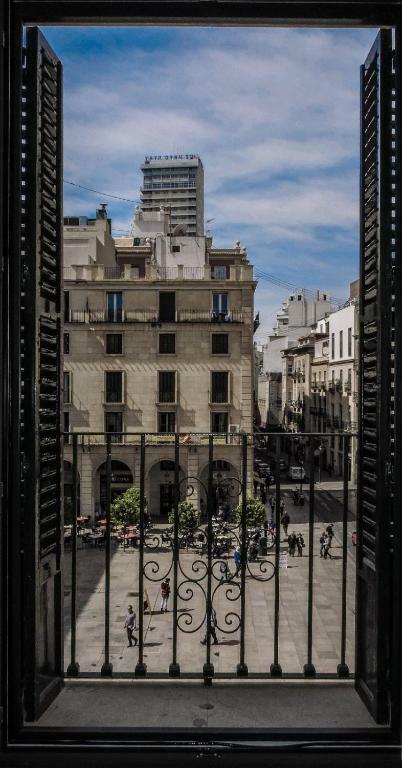 Explanada de España Boulevard is a 4-minute walk from Quo I Plaza Del Ayuntamiento, while Procathedral of San Nicolas of Bari is 1,200 feet from the property. The nearest airport is Alicante Airport, 9 miles from the property. 뀐 Located in the real heart of Alicante, this property has an excellent location score of 10.0! 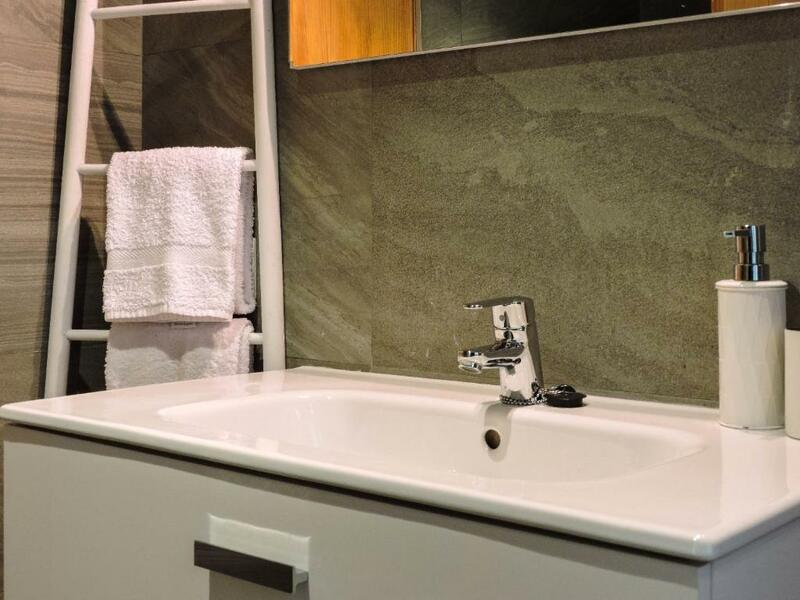 When would you like to stay at Quo I Plaza Del Ayuntamiento Apartament? This apartment features a seating area, washing machine and balcony. Public parking is available at a location nearby (reservation is needed) and costs EUR 13.50 per day. Desde el primer momento que adquirí el Apartamento supe que era el sitio ideal para destinarlo a apartamento turístico. Su ubicación inmejorable, en la misma Plaza del Ayuntamiento de la ciudad, desde él se puede ir andando a todos los sitios de interés cultural, comercial y lúdico y si necesita transporte con tan solo salir a la Explanada se encuentra con servicio de taxis, autobuses y tram, por lo que se encuentra perfectamente comunicado. De otro lado, una vez terminado el ajetreado día de vacaciones, encontrará en el Apartamento un lugar tranquilo y agradable para descansar, disfrutando de la luz especial que caracteriza a la ciudad y que recibe desde los cinco balcones que dan a la Plaza y de la tranquilidad que se respira en sus dependencias. Para hacer la estancia más cómoda, justo debajo tenemos comercio donde podrá adquirir todo aquello que necesite y la Oficina de Turismo de Alicante, donde le podrán informar de todas las actividades a realizar en la ciudad. Cuando en mis viajes me hospedaba en pequeños hoteles siempre pensaba la suerte que tenían sus dueños de poder dar un servicio personal a sus huéspedes y conocerlos personalmente, de forma que ocasiones hasta se convertían en amigos. Con Quo I Plaza del Ayuntamiento tengo la oportunidad de cumplir este sueño. 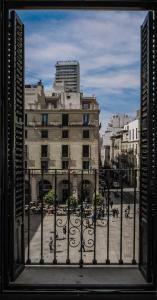 No quiero que Quo I sea únicamente un lugar donde dormir, espero que en él se relajen y puedan disfrutar de todos los encantos que tiene la ciudad, para ello estaré encantada de asesorarles y ayudarles en sus planes así como de facilitarles todos los servicios que necesiten. House Rules Quo I Plaza Del Ayuntamiento Apartament takes special requests – add in the next step! Quo I Plaza Del Ayuntamiento Apartament accepts these cards and reserves the right to temporarily hold an amount prior to arrival. Please inform Quo I Plaza Del Ayuntamiento Apartament of your expected arrival time in advance. You can use the Special Requests box when booking, or contact the property directly using the contact details in your confirmation. There was quite a bit of noise from the apartment above us, it is used as a language school so a lot of chair scrapping and talking that we could hear. Started early in the morning but went quiet from early evening. There was nothing we didn't like.The accomodation description needs updating.There is no swimming pool.There was no wine or champagne,bottle of water,chocolate or cookies. Three times mentioned-: bath, bath or shower,private bathroom.We were perfectly happy with the apartment. I would have appreciated a carton of low fat milk for a cup of tea or coffee. Tea bags and coffee were provided. But as the shop was still open it wasn't a problem. Fabulous apartment and facilities. The bed was super comfortable. Lovely outlook into the town hall square . Nice to be able to open the french windows to sit in the sunshine with a glass of wine. A small grocery store on the ground floor open until late. Very convenient as we arrived late in the evening and needed milk for a cup of tea. Couple of cafes in the square which closed early and were not noisy . Only steps away from lots of lovely restaurants and bars. Short stroll to lovely beach if you want a day in the sun. Lovely hosts. Liked Alicante very much. In the night there is some noise outside of youngsters who went out. Fantastic appartment and very kind and helpfull hostes Teresa, who also arranged a place to park the car. Close to everything beach, restaurants etc. The only negative point is noise level during the weekend. Since the flat is so closely located to the center, there is a risk to hear party goers on the street. The apartment was lovely. Our host waited for us, was very friendly and had organized a welcome basket. The flat is super, it's clean and well equipped. Perfect location, close to both the beach and the city center. Our host went the extra mile to provide beach towels for us. A recommendation! Lovely apartment in a great location. Close to all amenities and the beach.